Editor(s): Points, S.; Kunder, A. This volume contains the proceedings of the Cerro Tololo Inter-American Observatory's (CTIO's) 50th anniversary workshop. The aim of this workshop was to celebrate the 50th anniversary of the site selection of Cerro Tololo by exploring two fields in which the 4-m Victor M. Blanco telescope has played an integral part: the resolved stellar populations of the Galactic bulge and the Magellanic Clouds. Astronomers from many countries converged in La Serena during May 2013 to discuss the significant advances that have been made since our previous workshop, which took place 25 years earlier. 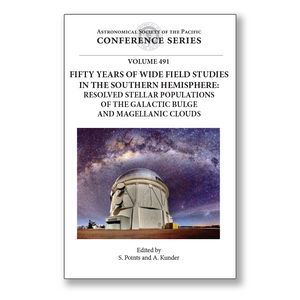 The historical section of this volume discusses how Cerro Tololo was selected as the site for the National Optical Astronomy Observatory (NOAO) in the Southern hemisphere and the key decisions that its directors made during those early years and through to the present. The majority of this volume details how the 4-m Blanco telescope has played a pioneering role in the field of resolved stellar populations toward the Galactic bulge and Magellanic Clouds. This conference also emphasized the important role that CTIO had in measuring the acceleration of the expansion of the Universe and the discovery of Dark Energy. Specific examples of scientific topics that were addressed during this workshop include: the formation of the Galactic bulge; the discovery of split horizontal branch stars in Galactic Globular Clusters; variable stars in the Galactic bulge; chemical abundances in the Galactic bulge; and the Magellanic Cloud stellar populations and star formation histories. These proceedings capture the excitement of CTIO's formative years and describes in detail how the wide-field capabilities of the 4-m Blanco telescope changed our view of the Milky Way and Universe.